A comprehensive guide to choosing the right portable canopy for your craft booth. Portable canopies are essential if you do outdoor craft shows, and some craft professionals use their craft tents at indoor shows as well. 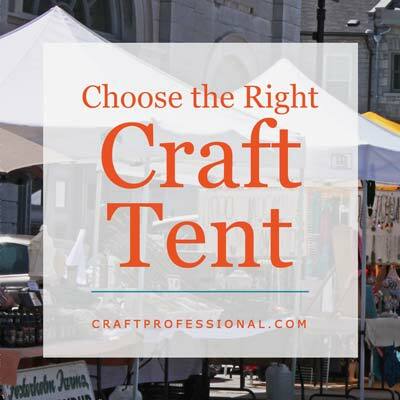 A craft tent is one of the pricier items you'll need to buy when you start to sell at shows, so you'll want to ensure you choose the right tent for your needs. There are several choices, and a few important features to consider. When you initially start to research tents, it can be a bit overwhelming. There's no need to panic or feel frustrated. I have gathered everything I've learned about buying craft tents here. 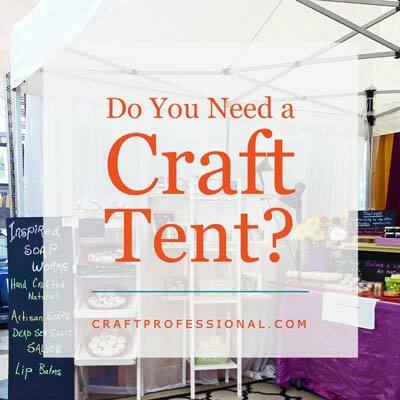 You can read through all of the articles and become a craft tent expert, or you can jump straight to the popular tent brands to see which portable canopies most craft business owners use. There isn't one, single tent that's right for all people all of the time. Luckily, though, there are a few reliable brands that are popular and used frequently at shows, so you really don't have to compare too many options to find the one that's right for you. There is a ton of information on this page. If you don't want to read the whole page, click one of the links below to jump down to a specific topic. If you want to get a full understanding about choosing the right tent for your booth, keep reading through the entire page. There are really just a few tent brands that are commonly used at crafts shows, and within each brand there are often a few models or options to choose from. In addition, the brands available will vary depending upon where you live. For example, EZ Up tents are quite popular in the United States, but they can be hard to find in Canada, where Caravan canopies are more commonly used. Want to know what tent is most popular in your area? Just go to a show (particularly an outdoor show) and take a close look at the tents. You should be able to see the logos on the tents. That will give you an idea which brand (or brands) is popular and available in your area. This tent is extremely popular among craft artists, particularly in the US. Check out the tents at a few craft shows, and you're bound to find several EZ Up tents. The Quik Shade Instant Canopy comes in a few models with different features and price points, and the commercial style is suitable for use at shows. If you purchase a Quik Shade Instant Canopy, do be sure to order a model that is 10x10, white, and has straight legs. The colored canopies with splayed legs are not ideal for craft shows, in my opinion, because they don't make the best use of your space, and it is hard to attach sidewalls to tents with splayed legs. The Caravan Canopy is the brand of tent that I own, and it has served me well. Read my review to discover why I chose this brand, and learn about a few things to consider if you're thinking about buying a Caravan Canopy. Hilary, from Salamander Feltworks, wrote to tell me why she loves her Undercover tent. She also had a smart strategy for researching portable canopies. Find out how Hilary found the right craft tent for her needs, and why she loves her Undercover tent. The Trimline Canopy, available from flourish.com, is a pricier option. Prices for this portable canopy start at approximately $900; however, this canopy is well loved by many professional craft artists, particularly those who have a well established business and do many outdoor shows each year and, therefore, require a canopy that stands up to a lot of use. Light Dome tents are also pricier tents. The prices start at $850 for the frame, canopy and 4 side walls. Craft artists who use the Light Dome tent say this is a sturdy tent and a good investment in your business. Like the Trimline Canopy, the Light Dome canopy is typically used by established craft artists who do several outdoor shows each year. If you are selling at an outdoor booth that has an irregular shape, you may want to consider using a white umbrella for shade. Here are several things to consider when buying a white market umbrella for your booth. A 5x10 canopy is another alternative if you are dealing with an irregular booth on a regular basis. They are not as readily available as the standard 10x10 models, but they do exist. Here's one company that offers white 5x10 outdoor canopies. There is some variation in the features included in different popular craft tents. Some features and accessories will be necessary for you, others will be nice to have, but not necessary. You'll need to decide which features are most important to you based on how you will use the tent. Keep this list of craft tent features in mind as you review different brands and models to find the one that's right for you. Some tents come with side walls included, others don't, and you'll have to buy them separately. To add to the confusion, some tents come with just three side wall (useful during shows, but doesn't allow you to fully close up your booth), while others come with all four. When buying a tent, you need to read the product description carefully to ensure you're getting exactly what you want in the way of side walls. Side walls are extremely useful for keeping out rain and sun at outdoor shows. They are also useful for blocking any unattractive views near your booth and creating a focused space to display your items. Sidewalls are useful to have when photographing your booth for submissions to juried art shows. The side walls help to focus attention on your booth and away from any outside distractions. Although side walls are extremely useful, they can also cause problems in even very light wind. Side walls catch the wind and can make your tent more apt to blow away in the wind if you do not properly weight your tent, so do be sure to choose some type of tent weights to use with your portable canopy. Don't confuse side walls with mesh display panels. Mesh display panels can be attached to the sides of your tent and used to hang items. Side walls are not designed to support the weight of hanging items; their function is to protect everything in the tent from the elements. ﻿A white canopy normally works best for shows. Some juried art shows specify that your canopy must be white. Colored canopies can make your booth area hot and dark and can affect the perceived color of your items. Learn More: More reasons why a white canopy is the best choice for most people most of the time. Look for a 10 x 10 canopy with straight legs. Ideally, you don't want a tent with splayed legs. A 10 x 10 canopy is best size for craft professionals because the vast majority of booth spaces measure 10 x 10. Luckily, this tent size is extremely common. You won't have any trouble finding a 10 x 10 canopy. Tents with angled legs (legs that angle in, so the tent is wider at the bottom and narrower at the top) are not ideal for use at shows. Straight up and down legs are a much better choice. Angled leg tents don't fit well inside a standard 10 x 10 space. They are typically 10 feet square at the base of the tent, and 8 feet square at the top. The smaller top means you don't get to make full use of your allotted booth space. Also, it's hard to put sidewalls up on an angled leg tent. You'll miss out on all of the benefits of being able to use side walls with your tent if you choose a model that has angled legs. 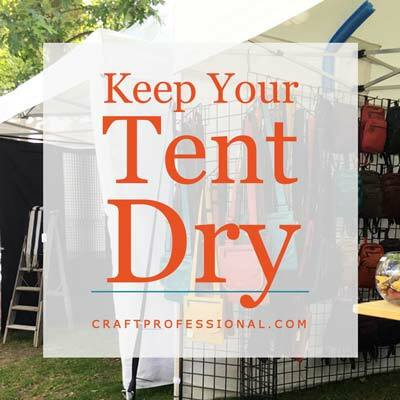 You may need to prove that your canopy is fire retardant, so look for that feature before you buy a tent for craft shows. Some outdoor tents have a tag stating that they are fire retardant right on them, but do keep any documentation that comes with your canopy in case you are asked to show proof. You might be starting to feel overwhelmed by all of this information. How are you ever going to keep track of it all? Don't worry! I've created a convenient, downloadable Craft Tent Comparison Chart to help you keep all of this information straight when you are researching portable canopies. It's really not that complicated once you get your information in order. It is absolutely necessary to secure your canopy with weights so it doesn't blow away. Most portable canopies come with stakes for anchoring the tent to the ground; however, there will be many times when you won't be able to stake your tent to the ground. If you are set up on cement, or you are not allowed to use stakes, you will need to have a good set of tent weights. People have come up with plenty of ingenious ways to create tent weights. You can buy ready-made tent weights for about $40 to $60, or you can make your own weights with PVC pipes filled with concrete and a ring bolt secured in the top so you can suspend the weight from the top of each leg. 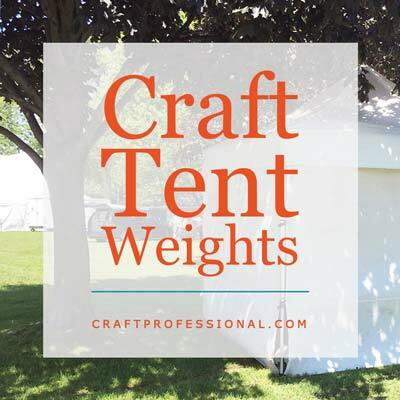 Whatever type of tent weights you choose, keep in mind that most people recommend you have at least 40 pounds of weight on each corner of your tent, and some craft show organizers require you to have your tent weighted in this way. 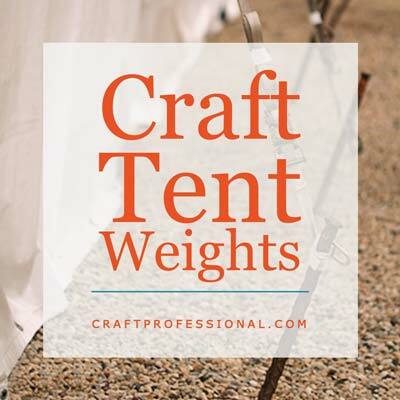 Here's a primer on buying or making tent weights for your craft tent. They really are an absolutely essential part of any outdoor booth. The only thing worse than getting rained out at a craft show, being stuck in a leaking tent at a rained out craft show. Here's how to help ensure the inside of your tent stays dry in the rain. Budget can be a big factor when deciding which craft tent to buy, especially if you're just starting out. Portable canopies can be purchased at every price range from about $50 to $1000 and more. We all certainly need to live within our means, but cost shouldn't be the only consideration when buying a craft tent. The quality of the tent will vary with the price of the tent, and the model that will best serve your needs depends on several factors. Will you be participating in several outdoor shows on a regular basis? If you will be participating in many outdoor shows, it makes sense to invest a little more in your portable canopy. If you are doing a couple of outdoor shows, but you are not completely certain whether you will commit to selling at outdoor craft shows for the long term, then you may want to look at a more inexpensive tent until you determine whether selling at outdoor shows is the best direction for your business. Based on the location of the shows you will participate in, will you likely encounter weather issues? Almost all craft artists who sell at outdoor shows face weather issues at some point. However, some locations are more prone to inclement weather than others. If you will be attending shows in an area that is known for rainy, windy or other weather related issues, you may want to put extra thought into considering how well your tent will stand up to the elements. How much can you afford to invest in a portable canopy? Craft tents fall into a huge range of prices. They span price points from being quite easily affordable for many people to being a major investment in your business. The primary features you need to look for in a canopy (in my opinion) are a white, 10 x 10 canopy with straight, not splayed legs, and those basic features can be found whether you are able to spend $100 or $1000 on your tent. 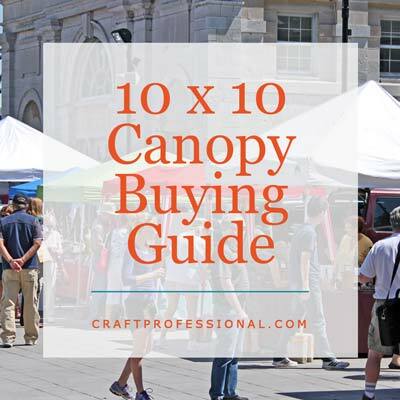 Don't feel you have to buy a top of the line canopy when you are first starting to sell at craft shows, particularly if doing so would break your budget. Look at starting with a mid-level tent, one that is professional looking, meets your needs, but still fits within your budget. Once your business becomes more established, if you feel you need a more high end tent, start to look around for deals on those tents. You will have more contacts once you've done several shows, and one of those contacts may be able to help you find a high end tent for a good price. Will you be setting up your outdoor shade canopy alone most of time? Some tents are known for being quite easy to set up alone; others require a little more effort to set up. Those who do craft shows alone need to look for a tent that can be easily set up by one person. That being said, any time my husband or I have seen someone struggling to put up a craft tent on their own, we have always helped out. At any of the shows I have attended, although people have been focused on their own booths, they were always friendly, and there always seemed to be a helping hand available if someone really needed one. Practice setting up your new tent in your backyard before you go to a show. If you are going to be at the show alone, practice setting up the tent alone; if you will have a helper, practice with your helper. Will the Tent Fit IN Your Vehicle? Before you decide to buy a specific brand of canopy, find out the dimensions of the tent when it is folded, and ensure it will fit in your vehicle. This check is particularly important if you drive a small vehicle. Also, consider the weight of your craft tent; there is a balance to be found between durability (heavier tents) and portability (lighter tents). The right balance for you will depend on how much wear and tear your tent will need to endure, and how heavy of a tent you can manage. There are some basics that I believe everyone should look for in a craft tent. Here's a list of questions everyone should ask themselves before buying a a particular brand and model of canopy. Are you confused about how to choose the best craft tent for your needs? 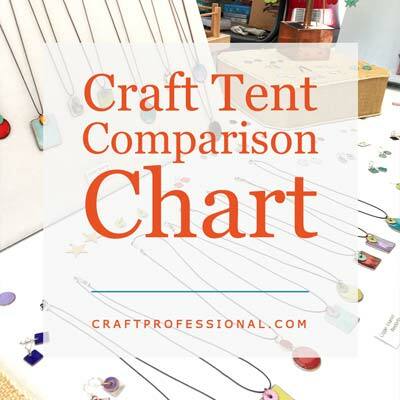 Here's everything you need to think about when choosing a craft tent, plus a free, printable craft tent comparison chart you can download to organize your research and choose the best craft tent for you. Is it Time to Buy a craft Tent? Renting a craft tent is often surprisingly expensive. Some people consider renting a 10 x 10 canopy instead of buying one. However, the cost of renting a 10 x 10 white canopy is often close to the cost of buying your own canopy. 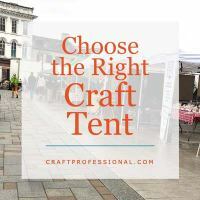 Do check your local party planning or rental center if you're not certain that you want to commit to buying a tent, but don't be surprised if the cost to rent a craft tent is quite high compared with the cost to buy one. Not sure if you really need to invest in a tent at this point? 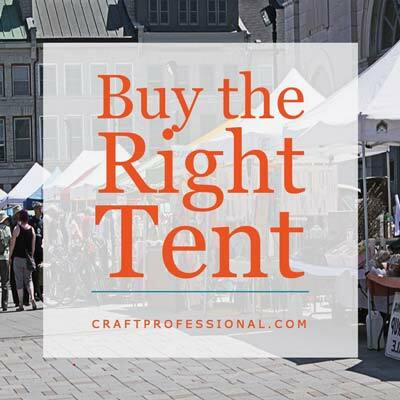 These tips on when to buy a craft tent will help you think through that decision. 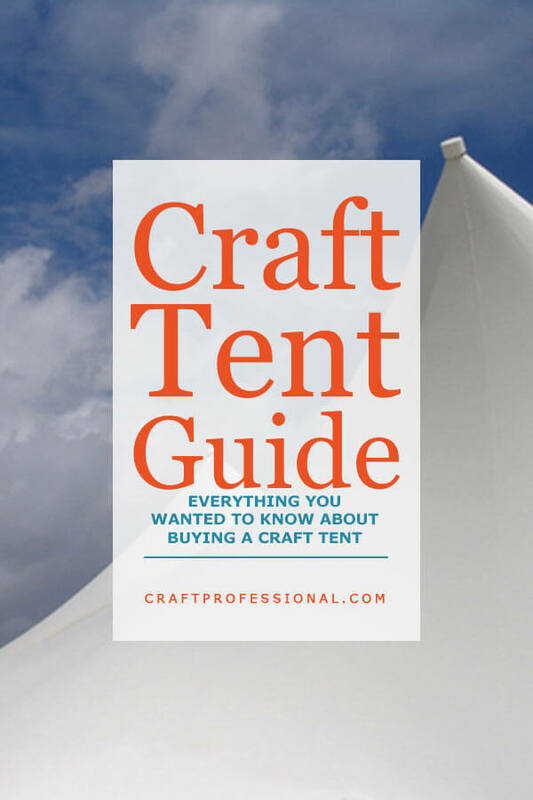 Learn More: Is it Time to Buy a Craft Tent? You can find several brands of white canopies suitable for use at shows at Amazon including: Ez Up Tents, Caravan Canopies, King Canopy, and Quik Shade Instant Canopies. Sam's Club, Costco, and some big box building supply stores also carry popular models of white 10 x 10 portable canopies at competitive prices. If you buy your canopy online, read the product description carefully to ensure you are buying the exact tent that will meet your needs, and be aware of the store's return policy as well as any shipping fees that might apply.